Map of North America with a view of the Niagara Falls. 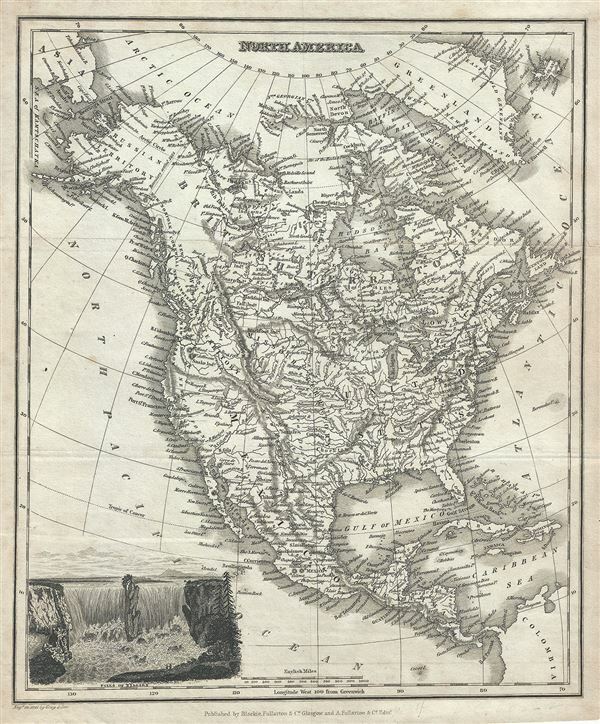 This is a nice 1834 map of North America by Blackie, Fullarton and Company. The map covers the entire North American continent from the Arctic Circle to the Isthmus of Panama, embracing all of Central America, Mexico, the United States, modern day Canada and Alaska. It offers fine detail throughout with elevation rendered by hachure. Notes American Indian tribes including the Blackfoot Indians, Snare Indians, Beaver Indians, Fall Indians and others. Both the Great Salt Lake, identified as Timpanagos, and Utah Lake, identified as Lake Teguayo, are rendered following Humboldt. The map also notes the apocryphal Buenaventura River running from the Rocky Mountains westward through 'Salt Lake' and westward to San Francisco Bay. The Buenaventura is the last incarnation of the apocryphal River of the West, a long sought after speculative alternative to the Northwest Passage. The mapping of Buenaventura here again references legitimate discoveries by Escalante of the White River and the Sevier River, mistakenly associated with the River of the West and given an erroneous outlet into San Francisco Bay. This map is particularly interesting as it is one of the earliest maps to accurately depict the Northwest Passage, predating the Robert McClure expedition by more than 15 years. It correctly maps what are today called the Northwestern Passages between Baffin Bay and the Arctic Ocean. The mapping extends as far west as Melville Island and Banks Island, though does not include Prince Patrick Island. Even so, beyond Melville and Banks Islands, there is little but ice and seasonally open sea as far as Alaska and the Bering Straits. A beautiful illustration of the Niagara Falls in included in the lower left quadrant. This map was engraved by Gray and Son and published by Blackie, Fullarton and Company, Glasgow and A. Fullarton and Company, Edinburgh. Very good. Minor wear along original fold lines. Minor spotting.